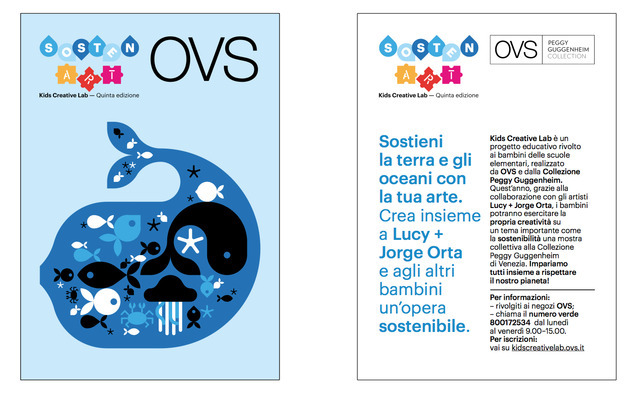 The Kids Creative Lab is an annual arts educational workshop devised by the Peggy Guggenheim Collection Venice, Italy in partnership with OVS, which is rolled out in primary schools across Italy. In the previous editions, the Kids Creative Lab involved over 550,000 children from 22,000 classes and 2,800 schools. The subject of the 5th edition of Kids Creative Lab is SostenART (Sustainable Art) conceived by Lucy Orta, along with the Department of Education of the Peggy Guggenheim Foundation in Italy. The workshop focuses on sustainability and the respect of the marine ecosystem, it involves the use of recycled materials and readily available, such as the plastic bottle. The ambition for the 2017 edition is to involve 1-million school children and the results of the workshop will be exhibited at the Peggy Guggenheim Collection in Venice, from 30 March to 17 April 2017.